The fatal shooting of an unarmed black teenager and the ensuing protests in Ferguson, Missouri has rocked America. Even the mainstream media with its aversion to the truth, has been forced to address the militarization of the police in America – albeit years too late. This is a short call from informing the mainstream media that the country has been living under pseudo martial law for decades. On April 13, 2013, the ACLU (Shasta Chapter) invited me to be their keynote speaker to talk about government secrecy, drones and militarization of America. The Ferguson shooting and its coverage it the media prompted me to highlight some of the points made during that talk as they relate to today’s events. Historians and political scientists have warned about dangerous war fever sweeping the United States. America’s entanglements overseas, its imperial ambitions, and the more recent “global war on terror”, a war of indefinite duration against an ill-defined shifting enemy, with no specific definition of victory, poses a grave danger to the very character of American government and society, unraveling the fabric of the Constitution. The framers of the Constitution recognized such dangers when they carefully subordinated the military to civilian authority and attempted to limit the power of the President to initiate war. Gregory Foster, a former Army officer and West Point graduate who now teaches national security studies at the National Defense University in Washington said that the principle of civilian control of the military—an early building block of American democracy- has been reversed and become the civilian subjugation to the military. That day is here. Aside from constant surveillance, and the notorious “kill list”, war has been internalized and the militarization of the police force has put every American in danger. The biggest threat to Americans now comes from those who are paid to protect them. A threat which has been building for decades. During the Clinton administration Congress passed what’s now known as the “1033 Program. The 1033 Progam formalized Reagan administration’s directive to the Pentagon to share surplus military gear with domestic police agencies. Since then, millions of pieces of military equipment designed for use on a battlefield have been transferred to local cops — SWAT teams and others — including machine guns, tanks, and armored personnel carriers. The Pentagon’s 1033 program has exploded under Obama. Clinton also created the “Troops to Cops” program, which offered grants to police departments who hired soldiers returning from battle, contributing even further to the militarization of the police force. But what is most alarming about the militarize police their training. Well equipped, trained, and encouraged by the likes of [now former] Mayor Michael Bloombergand New York City police commissioner Raymond Kel who proudly brag of “hav(ing) my own army in the NYPD” and who used that army to spy on peaceful Occupy Wall Street protestors.”, it should come as no surprise that a SWAT team should blow a hole in a 2-year old, or the police kill an unarmed teenager, and all other horrific acts of violence we witness every day being committed by the cops. 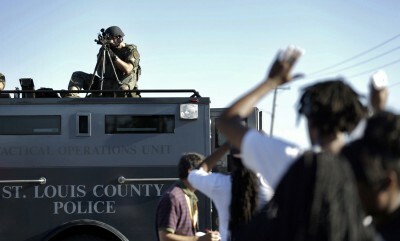 So why has the media been silent on the militarization of police up to this point? Well, they are the watchdogs of acceptable ideological messages, responsible for manufacturing consent – Their goal is to control the news and information available to society by using censorship and propaganda. Big media is not designed to serve the welfare of the public. So why break the silence now? The internet has made it virtually impossible to hide facts, and quite possibly, mainstream media has decided to do some damage control and take over the reins in order to control the flow of information. Regardless of what big media wants us to believe, what we witness is a blowback. Our wars have come home to roost. Soraya Sepahpour-Ulrich is a Public Diplomacy Scholar and Independent Researcher.